Do you have food memories that take you right back to a moment in time? I do. Most of my memories are linked to food (there’s an over emotional post, very close to my heart, about that subject in case you fancy a peek: here). Fish pie immediately takes me back to introducing my babies to food. That time between 6 months and 18 months was, if I’m honest, not an easy one. The visitors looking for new baby cuddles had stopped and suddenly I was faced with two miniature people moving (fast) in opposite directions. Then the food, oh geez, the food. I felt like I spent a year crawling around on the floor cleaning up highchair debris. Oh course, it was full of happiness too. I’d managed to keep two babies happy and okay for almost a year, which basically made me a genius. Ha! I look back on that time as a bit of a blur. Now, for friend’s who have new babies, that’s the time I try and rally around. I appear with food parcels and gin in a tin and say, I know, this bit is hard and lonely, but you’re doing a grand job and you’ll get through it. 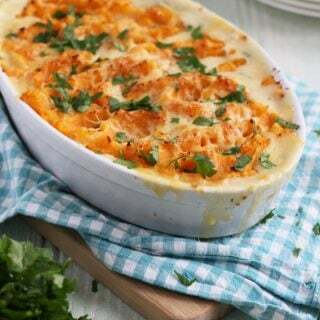 Fish pie takes me instantly back to that time. I used to make it every single week as it seemed to be one of the only dishes that was always a win with those babies of mine and was also a comforting supper for us too. 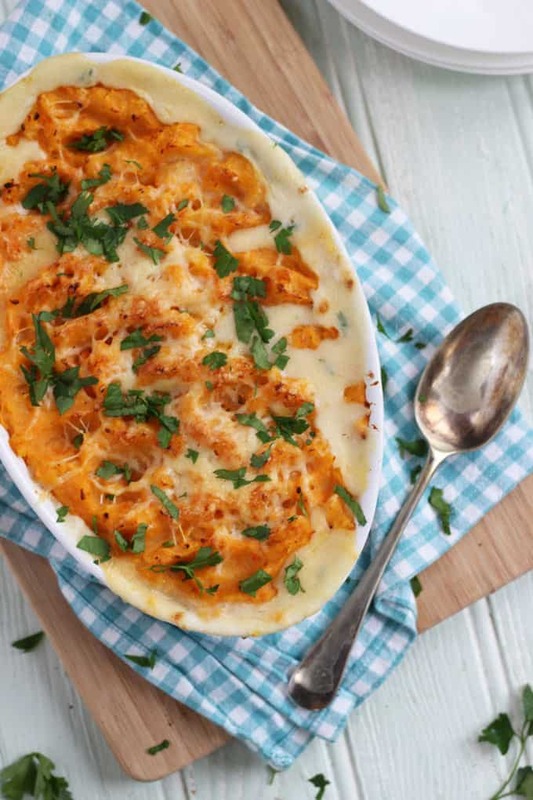 This version is made with sweet potato on top for added health benefits. Why didn’t I think of that for a bit of variety during those weaning years?! 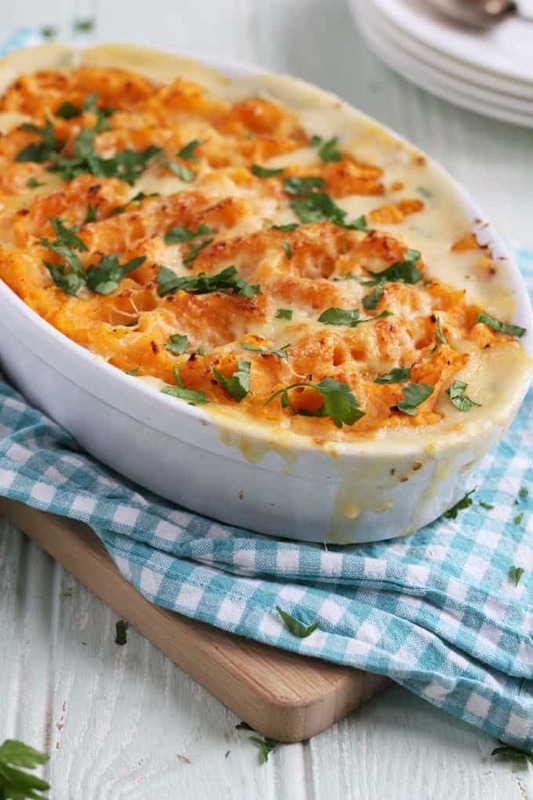 This also freezes well, unbaked, for pulling out of the freezer on a cold night night when you need some cosy food. For now, I will always eat this and remember those early years of tiny babies and be grateful that the floor is a little less mucky these days. Which food takes you back to another moment in time..? 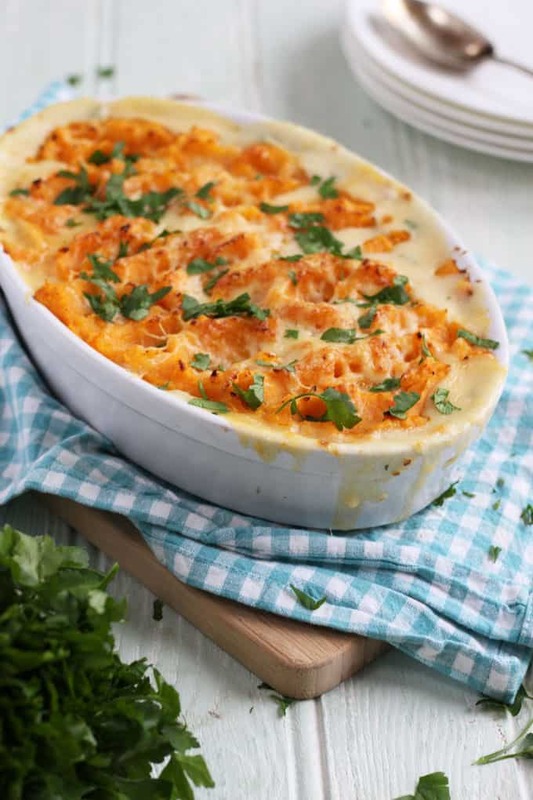 If you feeling like an easier option, you can buy and use ready made sweet potato mash. You could also buy ready cooked Norwegian salmon to speed up the recipe. 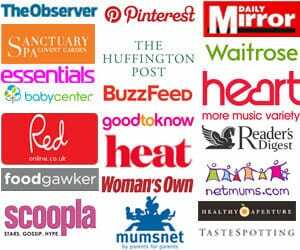 Of course, this makes an excellent weaning recipe for babies! Just leave out the salt of course. Fancy some other easy fish recipes? How about my Italian Baked Cod or my Homemade Fish Finger? Hope you enjoy this recipe as much as we do. 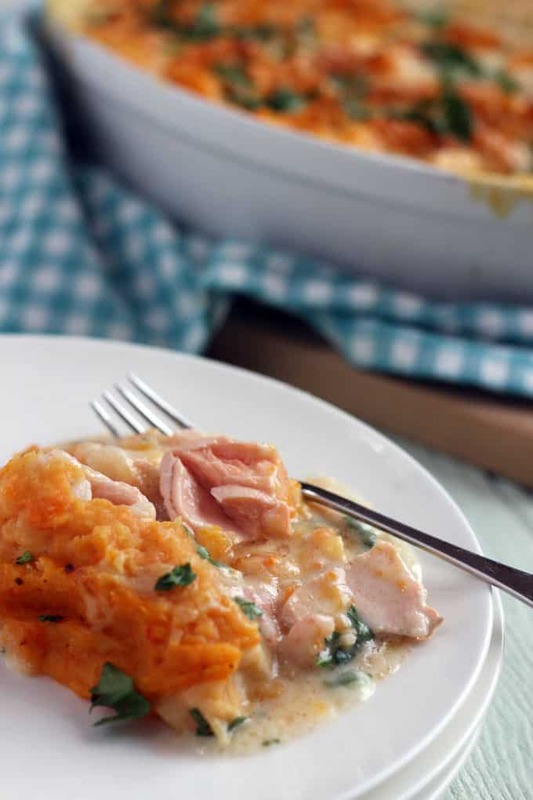 I’d love to know how you got on and what you thought of it if you make this Sweet Potato Fish Pie recipe. Please rate the recipe and leave me a comment below if you do. Pierce the potatoes all over with a fork and lay on a baking sheet. Bake in the oven until tender. This will take about 35-45 minutes depending on the size of your potatoes. Whilst the potatoes are cooking, prepare the filling. Add the fish to a pan that will fit the fillets in a single layer and scatter over the onion. Pour over the milk, dot the surface with one third of the butter. Bring up to a steady simmer, cover with a lid or tight fitting piece of foil and poach until the fish is cooked all the way through. Using a slotted spoon, remove the cooked fish to a plate and allow to cool a little. When it is cool enough to handle, flake with a fork, discarding the skin and any little bones you find lurking. Add the flaked fish to a baking dish and evenly scatter over the prawns. In a clean saucepan melt the remaining two thirds of the butter, then stir through the flour to form a roux. Allow to cook over a gentle heat for a couple of minutes before pouring over the poaching milk. Whisk constantly over a medium heat for about 5 minutes until the sauce is thick and smooth. Season to taste with salt and freshly ground black pepper. Stir through the chopped parsley and pour the sauce over the fish, spreading it evenly. Once the potatoes are cooked, cut them in half and scoop the flesh into a bowl. Add the butter and mash with a potato masher until smooth, adding a splash of milk. Stir in half of the cheese. Using a fork spread the potato over the fish filling and fluff up the top. Sprinkle over the leftover cheese and bake in the oven for around 30 minutes, until the pie is bubbling and the top golden and crisp. Disclosure: This recipe was an advertorial post commissioned by the Norwegian Seafood Council. As always, all opinions are truthful. What temp should the sweet potato and he whole dish go on for? Made this for my family it was delicious! Also never seen my two year old son stop so much between every mouthful to exclaim it was yummy!